I won’t lie. It took me a while to get into this novel but at the end of the day I have to say I really did enjoy it! I’ve heard a few friends mention that they didn’t care for it because they kept waiting for something to happen….maybe that’s why I did end up enjoying it so much…I finally stopped trying to figure out any surprises or to look for something to happen….let’s face it…the story itself is what is happening….from start to finish life and the end of life is happening….this is one of those rare books that you don’t have to look for the unexpected. You don’t have to follow a storyline of ups and downs…you just need to sit back and follow along in the life of the day of survivors of an epidemic that has wiped out the majority of Earth’s population. 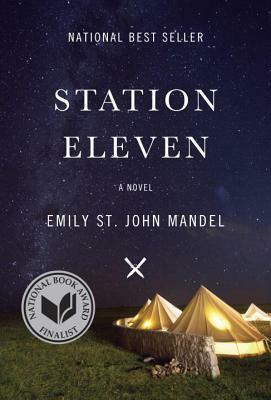 I believe that with the success of this book that there will be a second novel….it would be wonderful if we are lucky enough for Mandel to grace us with another…I would love to hear more about Station Eleven. I would love for all the characters to meet up at some point…having said that, don’t go into this feeling you might be disappointed with a storyline that didn’t end….remember! This isn’t that type of book…. It’s well worth the investment of your time….